W3webschool is a Kolkata based Training & Recruitment Training Institute delivering classroom and online training in India. If you want become professional and experienced web designer w3webschool best for your career. We providing high quality training at affordable fees is our core value. We offer classroom and online training on niche technologies which are in high demand. All our trainers are IT professionals with rich experience. We work with our students in developing the right skills they need to build their career in present competitive environment. We have flexible batch times to suit the timings of graduating students and working professionals. Web Designing is ever green technologies which will be present our information to the whole web world. 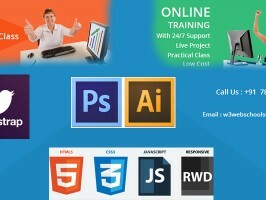 Our Web Designing Training in Kolkata provides End to End support. We are trained individuals, who have been professionally linked to the field of web. This course trains you how to create WebPages for various devices, using the latest industry standards. Expert Professional Trainers: Our Trainers are Working Professionals having vast Experience. Daily Assignments: We give our student daily assignment for clear concept. 24×7 Support: We are ready to serve after admission and provide quality maintenance of services. Free Study Material: Prepared by our Trainers for our Students with lot of examples. 100% Live and Practical Project: We help our students in developing Real time Project. 100% Job Placement: W3webschool offers 100% job placement guarantee in expert level courses. Free Demo Class before admission: W3webschool offering free demo before admission.